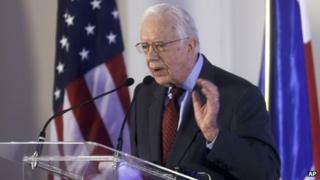 Former US President Jimmy Carter has said he hand-writes letters to foreign and US leaders in an effort to evade what he described as pervasive US electronic surveillance. Mr Carter, 89, told the Associated Press he had "no doubt" the US monitored and recorded "almost every telephone call" and email. His humanitarian efforts bring him in contact with a range of foreign and US political leaders. He left the White House in 1981. "I don't think there's any doubt now that the NSA or other agencies monitor or record almost every telephone call made in the United States, including cell phones, and I presume email as well," Mr Carter told the Associated Press news agency in an interview. "I feel that my telephone calls and my email are being monitored, and there are some things I just don't want anybody to know," he added, describing modern surveillance as a violation of Americans' basic civil rights. Mr Carter said he began writing letters in long hand two to three years ago, before former ex-National Security Agency contractor Edward Snowden leaked a cache of documents disclosing the agency's extensive electronic surveillance practices. The former US leader, a Democrat from Georgia, now runs the Carter Center, focused on human rights efforts and political mediation. He was responsible for negotiating a 1994 nuclear disarmament pact with North Korea and has visited Syrian President Bashar al-Assad in recent years. Mandela death: Who next as the world's elder statesman?